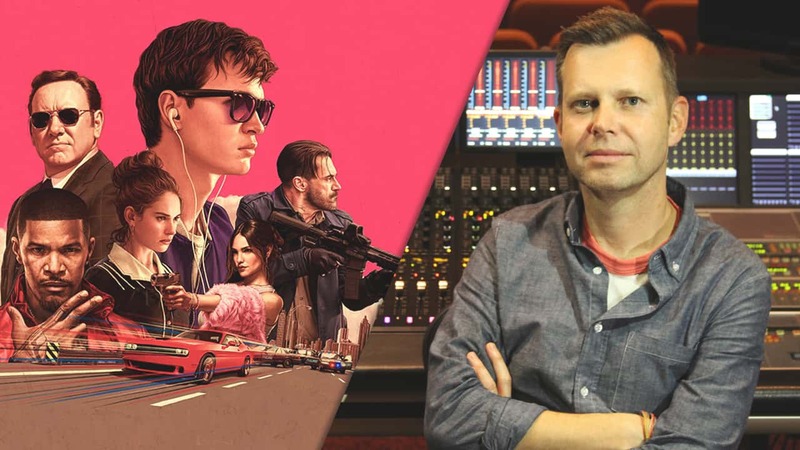 Sound Designer Julian Slater (Mad Max: Fury Road, Jumanji) was the major driving force behind Baby Driver’s high-octane soundtrack. We got inside Julian’s head to discuss how he syncopated sound effects and music to drive the story behind the critically acclaimed film – and which Waves plugins starred in the soundtrack, nominated for Best Sound Mixing and Best Sound Editing in the 2018 Academy Awards. “An Action Musical.” If such a movie and such a genre ever existed, Baby Driver is it. We’ve asked Oscar-nominated re-recording mixer and sound designer Julian Slater how he put the pedal to the metal to steer the film’s one-of-a-kind, action-packed symphony of music and sound design. Julian, how did you combine the processes of sound editing and sound mixing for this film? Edgar [Wright, Director] wrote the movie from the ground up with sound in mind. It’s the DNA of the script, and this was something that hadn’t been done in its entirety like this before. Especially the real-world sounds working together with the music. Our #1 goal in Baby Driver was to portray the soundscape through the perspective of the main character, Baby. He has a hearing deficiency called tinnitus, a condition that causes the perception of noise or ringing in the ears. He listens to music with his earbuds throughout the whole movie to block out his hearing condition. In order to successfully pull off the getaway drives for the robberies in the movie, he needs to listen to the right track in order to get in the motion. So, the goal was to get the multitude of sound elements to work together with the music so that they are musical but also believable and cinematic. For example, throughout the movie, whenever Baby removes his right ear bud while he’s listening to music, you hear music coming only out of the left side of the mix; which is quite unconventional in terms of mixing. We wanted the audience to understand how Baby is living and perceiving the world with tinnitus. The other challenge was the syncopation of all the sound design to the music to create a ballet dance between the music and sound elements to work as harmoniously as possible. Unlike a traditional movie where we work in timecode or feet and frames, we had to work in bars and beats for large sequences. Each piece of music is tempo-mapped so that in any given point in the movie we could sync and edit real-world sounds and effects to the music and keep the pitch and the feel of the action and music grooving together. This was quite a process, as most of the music was not a set 'gridlocked' tempo. As these music cues are not contemporary and very organic, the tempo of the tracks would ebb and flow throughout its duration. How were you able to translate the perceptual effects of Baby’s tinnitus to the audience? In doing research for the film, we were able to speak to several people with tinnitus and ask what it meant to them. We created the high-pitched ringing sounds using a signal generator as a starting point. But, as we were working on the film, we realized that if we’re going to play that sound repeatedly in the theater, it will annoy a lot of people! So, the pitch of the ringing in the ears you hear in the finished film is actually lower than we intended to have it. The fact is, the younger you are in age, the higher the frequencies you can hear. As you get older, your ears begin to lose their function, and we begin to lose our ability to hear very high frequency ranges. We discovered that audience members ages 25 and under were getting quite annoyed by the sound, as opposed to the older people, or closer those closer to 50 years old! We also used different high-pitched sounds throughout the movie depending on what the situation is. Sometimes we used the a very high-pitch whistle sound that we would pitch according to the key of the music featured in the scene. Other times, we would pitch up [Composer] Steven Price’s strings within the score. Or even pitch-up the break squeals of tires. How were you and director Edgar Wright able to create an Action Musical with the use of songs and musical cues? This movie is really the opposite of how music is normally implemented into a film. Typically, for say an action sequence, you would have specifically composed score for the specific action, and that score would have its own inherent ebbs and flows to it. We didn’t have that; we would have a rocking music track that was four minutes of all-out energy. We were able to obtain the stereo masters for the songs, but many of them were recorded years ago and actually did not sound as great as you’d expect. So, I basically did a music pre-dub where I remastered the music from the stereo master and upmixed them to 9.1 beds [Dolby Atmos]. For Baby Driver, our saving grace was that we had the luxury of having all the music cues already sort of baked-in, even before the shooting began. So from day one, we were working to those music cues knowing that they weren’t going to change. All the pitching and tempo mapping and time-stretching and editing was not ever going to be in vain because we knew those music cues weren’t going to change. One thing that helped us tremendously in the remastering of the music cues was the Scheps Parallel Particles plugin. We’ve used some very iconic recordings in the movie – songs we’ve all become accustomed to for their lush, beautiful sound. But when you put the same recording in an acoustically controlled cinematic environment on large speakers, they actually don’t sound that great. So many of the music tracks went through Scheps Parallel Particles to give them warmth and quite often that needed sparkle. To enhance the low end and give the recordings more richness, we also used the LoAir subharmonic generator plugin. Take us behind the wheel of the opening car chase scene. How did you combine the music and all sound elements in this scene together? The opening sequence features barely any dialogue other than a couple “Whoa’s!” during the car chase. The music and sound design were weaved together to portray Baby’s perspective and to literally drive the scene [laughs]. The gunshots, the windshield wipers, all the way up to the car door open chime at the end of the scene are in sync with the music. The Jon Spencer Blues Explosion track that we used, “Bellbottoms,” is a cranking track. So the trick was to get as much richness and as much life out of the music cues as possible. There are instances when we pull back on the mix in an almost imperceptible way to make room for other stuff like the gunshots, door slams, tire screeches, police sirens. For example, all the police sirens are tempo mapped to the cues in the music throughout that whole opening scene. The music is driving the scene. So the trick was to make the sound design and effects more musical and in sync to work with the background score as one. It was not only a level issue in the mix. It was also an agreement issue, deciding where to place the sirens in the scene while keeping the groove of the music. We timed everything so as not to take our foot off the gas pedal! Because we’re taking Baby’s point of view throughout – or I should really say his ‘point of hearing,’ listening through earbuds – the balance between all these elements had to be paramount. The trick was also to make these tempos work musically and cinematically. Julian, from your own point of view of an Oscar-honored sound designer, what tip would you give an aspiring sound designer or effects editor? Whether you’re a sound designer, editor, re-recording mixer, or overall sound person on a film project, I believe your job is to make the movie sound unique from the next one. Reflecting what is on the screen is the easy thing. The hardest thing is to look at the sound from a different perspective, and to try and think about how you can engage the audience. Take yourself outside your role as a sound designer and try to think like an audience member. It’s easy to get wrapped up in the work you’re doing. Whenever I’m working on the scene, I try to watch it as if I’m an audience member and forget about my job as a sound person. You’ll find ideas will come to you by taking yourself out of being a sound designer or mixer for the moment, and just watch it fresh as a movie. If you’re like myself, you can get the chance to reset your brain, get inspired again, and come with some great ideas that are not specifically based on the job. Looking for more on sound design? Discover sound design videos, interviews and tips on the Waves blog.